"We also infer that the differentiation of genetically modern humans may have started as early as 100–120 kyr ago12, but considerable genetic exchanges may still have occurred until 20–40 kyr ago". And is still going on. Anyway haplogroup evidence shows that the surviving haplogroups have been zooming fairly widely around the earth. "All three populations have an elevated effective population size between 60 and 250 kyr ago, possibly due to population substructure11". "the human dispersal out-of-Africa event around 60 thousand years (kyr) ago". The 'dispersal' is far more complicated than just a single population emerging from Africa at any single time, let alone specifically '60 thousand years (kyr) ago'. "An easy reconciliation of the archaeological divergence times with the genetic evidence, would, of course, be immediately effected if the 'slow' family-derived rate is adopted: this would double West/East Eurasian split time to about 40kya, but would also push back the split of West Africans from Eurasians to the dawn of anatomical modernity to more than 200kya, and, the African hunter-gatherers (not examined here) well into multiregional evolution time depths". That might be the case though, although the time need not necessarily be 'doubled', just 'longer'. "gene flows may have occurred between the different populations again"
I suspect this to be the flow of population along the snowline following big game. Connecting Europe with East Asia. Even if there is population structure from 200kya to 60 kya, this would have been population structure involving populations that were originally less differentiated than the continental populations today, and there is no a priori reason to think that proto-Africans, proto-Europeans and proto-Asians would have lined up neatly into cleanly divided groups from each other. The relative unity of Y-DNA and mtDNA origins for Eurasians that seems to have just a couple of roots each in Africa phylogenies also argues against really deep population structure, pre-OoA in Africa. The spread of rare mutations by continental populations that was recently released, also strongly disfavors any significant cross-continental gene exchange in the Upper Paleolithic or early Neolithic. Very few rare mutations are shared by multiple continental groups compared to what one would expect with even extremely thin levels of gene exchange between them. Not sure what you mean by that; the Y chromosomes coalesce to 142ky, so, by definition, are unsuitable for detecting population structure. Note also, that including African hunter gatherers would almost certainly push the earliest split in the human family tree to the dawn of anatomical modernity, even if no adjustment to the mutation rate used in this paper is needed. The paper was submitted in 2009, quite a long time ago in genome-sequencing years. Pushing the earliest split in the human tree to the dawn of anatomical modernity may be correct, but it certainly has implications that a lot of people will not like. "I suspect this to be the flow of population along the snowline following big game. Connecting Europe with East Asia". I think you are absolutely correct. Y-haps R and Q are related and seem to have parted ways in Central Asia along the snowline, R going west and Q going east. 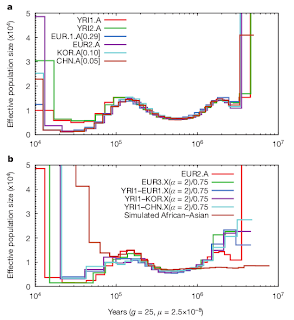 "this would have been population structure involving populations that were originally less differentiated than the continental populations today, and there is no a priori reason to think that proto-Africans, proto-Europeans and proto-Asians would have lined up neatly into cleanly divided groups from each other". Why do you think that? In H. erectus times there was surely less genetic movement than there has been since 'modern' humans appeared. Therefore it is reasonable to assume greater ancient regional diversity than remained during the Upper Paleolithic. 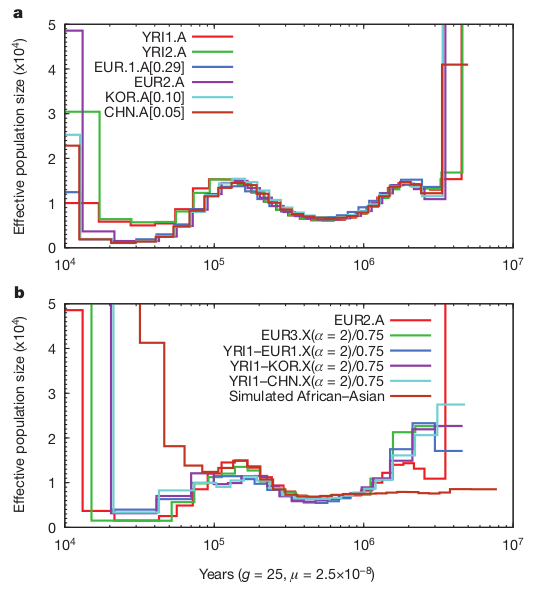 "The relative unity of Y-DNA and mtDNA origins for Eurasians that seems to have just a couple of roots each in Africa phylogenies also argues against really deep population structure, pre-OoA in Africa". Not really. By the time Y-hap CT and mtDNA M and N left Africa Y-haps A1a, A1b, A2, A3 and B (and possibly B1 and B2) had appeared, and (according to Maju's old diagram) mtDNAs L0, L1, L2 and L5 had already diversified, some considerably so. And just two of the several L3s made it out so we can presume the others spread round much of Africa as M and N moved out. "Pushing the earliest split in the human tree to the dawn of anatomical modernity may be correct, but it certainly has implications that a lot of people will not like". What implications would a lot of people not like? The point I was trying to make (and misworded a bit) was not the pre-OoA Africa has no population structure at all, but that the proto-Eurasian population in Africa prior to OoA likely had little population structure. All Eurasians on the Y-side desecend from D (which is a thin offshoot of DE and a thinner offshoot of overall African diversity) or CT (which is a thin offshoot of a common ancestor of B and CT). All Eurasians on the mtDNA side descend from M or N which in turn descend from a very basal form of L3. These facts suggest that the Out of Africans did not arise from many parts of the African population structure - probably just one to three, quite possibly just one. So, Eurasian population structure probably wasn't very advance within Africa before AMHs left at OoA. "These facts suggest that the Out of Africans did not arise from many parts of the African population structure - probably just one to three, quite possibly just one". Thanks for the clarification. I now agree. However the variation outside Africa now becomes most easily explained as being a product of interbreeding with pre-existing Eurasian populations. A population that contains just two mtDNA lines and at most three, and possibly just one, Y-hap line is unlikely to have enough genetic variation to survive for many generations.